This is the fourth in a series of Posts on Sheets. My previous post dealt with adding a revision schedule to a sheet. In this post, I will look at how Revision Clouds work and how to connect them up with the Revision Schedule. 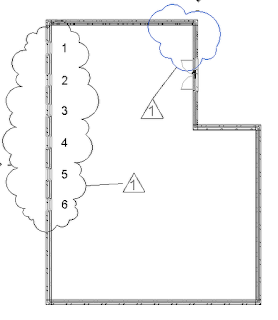 Revit includes a system for adding revision clouds. It does this in a specific way, so you need to understand the workflow associated with revisions in Revit. Lets start by adding a revision cloud. Open one of the views that is placed in a sheet with a revision schedule. From the Annotate panel, select Revision Cloud. Pick a starting point and draw the cloud in a clockwise fashion ending up at the start point to close it. Click the correct mark under mode to finish. Select the cloud and look at the properties palette. The revision property is set to the most recent revision for the sheet that the view belongs to. Each cloud revision can be associated with one revision. Remember also that each view can only belong to one sheet. You can change the revision to any of the views previous revisions provided that revision hasn't been issued. I will get to issuing revisions shortly. Notice the revision is prefixed with the Sequence. Remember the Sequence is a unique sequential number for all revisions in your project. Add some text in the Comments field. Next you need to add a tag to the revision cloud. In the Annotate panel again, select Tag by Category. Then select all the revision clouds. The numbers in the tags match the revision number associated with the revision cloud. 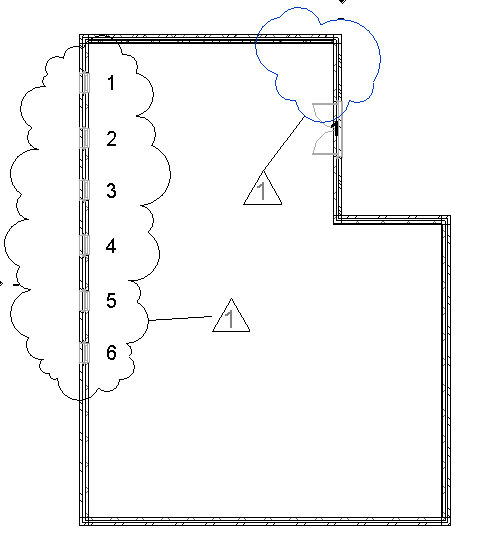 In my example, both clouds are associated with Revision 1. What if I want to see the comments also. 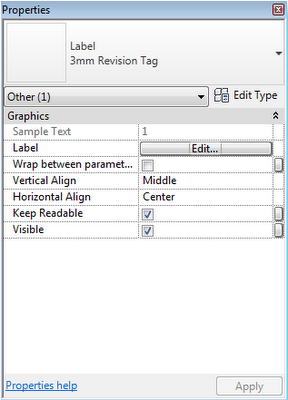 You can edit the revision tag family. Right click on a tag and select Edit Family. 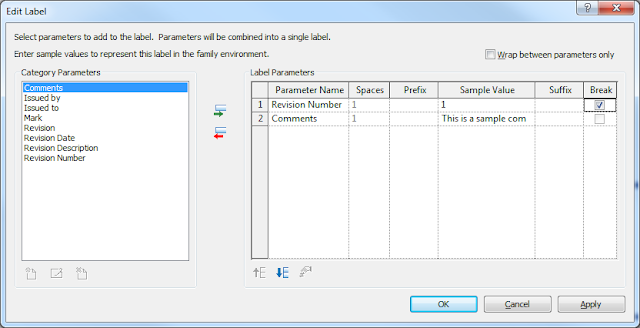 Select the Label which will be indicated by what is set i the Sample Text. Click the Edit button beside Label. 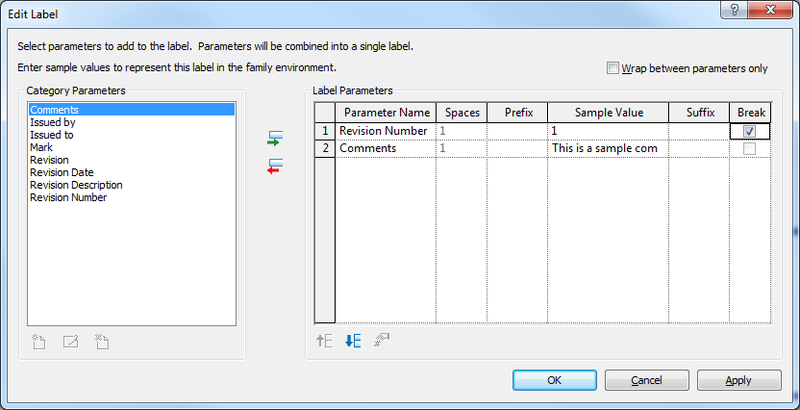 Select Comments from the Category parameters and add it to the Label Parameters. Tick the Break box for Revision Number to place a line break between the Revision Number and Comments. Click OK to complete. For this example, we will delete the triangle which enclosed the Revision Number. It ain't pretty, but you get the idea. You can change the properties for the text of the label to spruce up the appearance a bit. Load the Revision Tag back into the Project. You may also want to beef up the line weight for the cloud to make them more prominent. In the Manage panel, select Object Styles. Select the Annotation Objects tab. Scroll down until you find Revision Clouds. The default line weight is 1. Change this to something heavier, maybe 6 or 7. You should change this in your templates also for consistency. These are reasonably obvious and a typical strategy would be to select None for all revisions but the current. The wonderful part about this system is that you never loose any of the revision information. 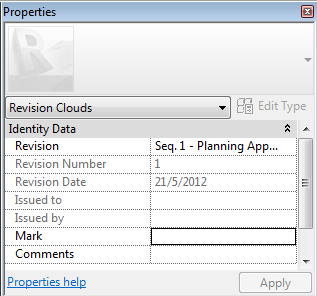 Revit allows you to keep track of Revisions that are issued. You just simply Tick the Issued box for the relevant revision. Once this is done, you cannot add any further revision clouds to that revision. It can be undone by deselecting the Issued box if you make a mistake. You can merge revisions that are not issued. This will merge all revisions either Up or Down from the selected Revision. All Revision Clouds will merge onto the merged Revision. You can move the Revisions to change their order of appearance. Remember, Revit automatically numbers the revisions to the numeric or alphabetical order will not change, just the revision itself. I think you will agree that the overall system for managing sheets and revisions is quite smart and certainly a massive improvement on AutoCAD. It take a little bit of getting used to but once you do, you will not look back. 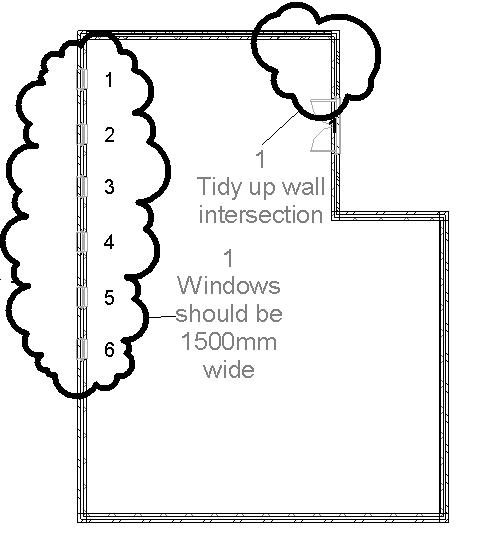 If you need more help, use the Autodesk Wiki on Preparing Construction Documents. Oh and the promised template. The template is the AEC UK Revit Architecture template upgraded to Revit 2012 and includes an A1 and A3 title block with Revision schedule.